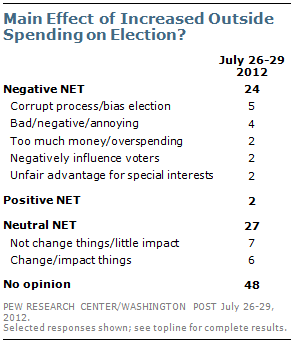 The public is hearing little about increased spending by outside groups in the 2012 election. 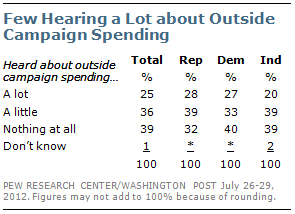 Just 25% have heard a lot about outside spending by groups not associated with the candidates or campaigns, while three-quarters are hearing a little (36%) or nothing at all (39%) about this. 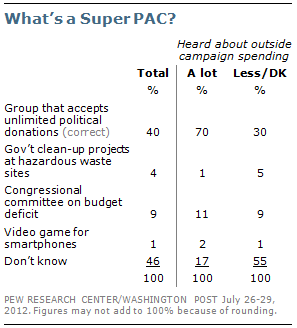 In fact, the term “super PAC” itself is not widely known: Just 40% can correctly identify the term, nearly half (46%) don’t know what it refers to, while 14% give incorrect responses. When asked an open-ended question about the effect of increased outside spending on the election, a plurality (48%) expresses no opinion. About equal percentages indicate the effect will be neutral (27%) or negative (24%). Just 2% give a positive response about the effect of more outside political spending. Those who have heard a lot about this issue –which includes nearly equal shares of Republicans and Democrats – nearly half (47%) say increased outside election spending say it will have a negative effect, while 35% say it will have a neutral effect. Among those who have heard little or nothing about increased outside spending, most (59%) have no opinion; 24% say the impact will neutral and 16% say it will be negative. The latest national survey by the Pew Research Center for the People & the Press and The Washington Post, conducted July 26-29, 2012 among 1,010 adults, finds that few people thing either Barack Obama or Mitt Romney is gaining an advantage as a result of increased election spending by outside groups. About half (51%) say neither candidate will benefit more than the other, 16% say Romney will benefit more than Obama, while about as many (15%) say Obama will benefit more than Romney. There are only modest partisan differences in views of whether Obama or Romney will benefit more from increased spending by outside groups. A majority of Republicans (55%) and a plurality of Democrats (42%) say neither candidate will benefit more than the other. 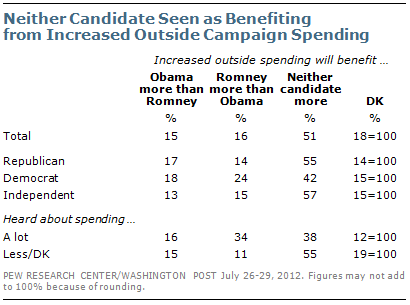 Among those who have heard a lot about increased campaign spending by outside groups, 34% say Romney will benefit more than Obama, while 16% say Obama will benefit more. Reflecting the public’s low level of awareness about campaign finance and this year’s election, just 40% can correctly identify a “super PAC” as a group that is able to accept unlimited political donations. Nearly half (46%) don’t know what the term refers to, while 14% give incorrect responses. Partisan differences in knowledge of the term are modest. Seven-in-ten (70%) of those who have heard a lot about increased campaign spending by outside groups correctly identify a Super-PAC. That compared with just 30% of those who have heard less about the issue.